To learn just how football fans watch their favorite teams on game day, you could visit one viewing party after another, making observations and taking notes along the way. Or you could use the powerful combination of mobile technology + crowdsourcing and save a great deal of time, money, and energy. That's just what Field Agent did. 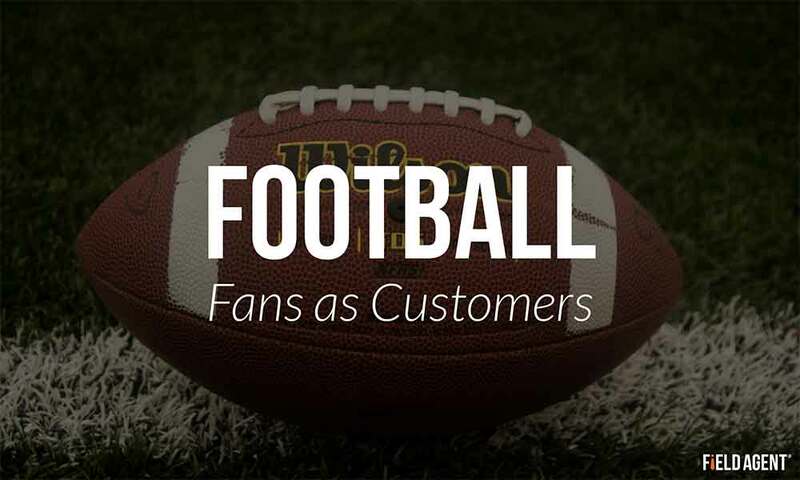 We asked 250 football-minded customers across 39 states to let us tagalong with them on the inaugural day of college football 2014, something mobile technology made easy. Our goal was to profile football fans in one of their most natural habitats—at home, in front of the TV, with a large spread of snacks and beverages. One unique strength of mobile market research is the ease of capturing photos and even videos of in-store and at-home events, like the first full day of college football season. All 250 consumers watched at least one televised football game from their homes on the first full Saturday of the 2014 college football season. 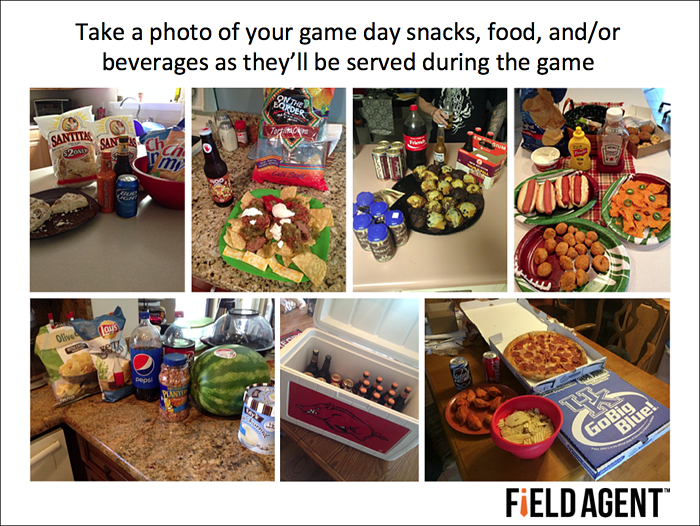 Additionally, each customer in the sample purchased at least one food item to enhance the game-viewing experience. A majority (51%) invited one or more guests to their home to enjoy the festivities, with 8% inviting 6 or more guests. 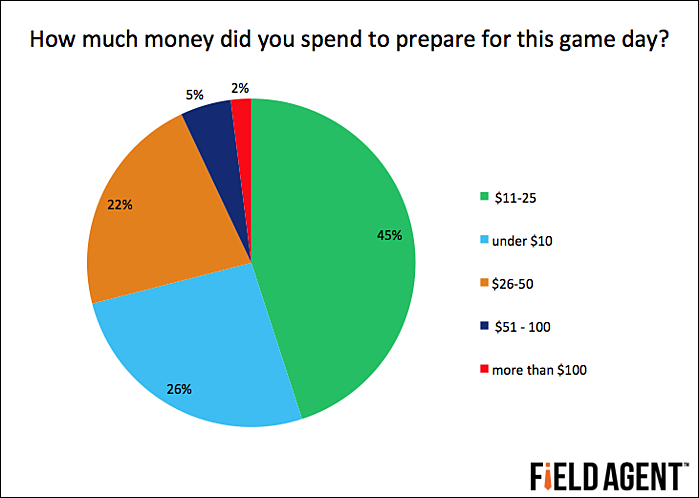 Asked how much they spent at retail in preparation for the first full day of football, 71% said they purchased less than $25. Only 7% spent more than $50. Our sample treated game day as a chance to depart from their normal diets. 77% indicated they would eat relatively more frequently on the first full day of college football, and 86% admitted they would eat relatively more calories. It was also a day for drinking more. 65% agreed they would drink more soda and 51% that they would drink more alcohol when compared to a typical day. We wanted to get even more specific, to learn exactly what these football fans and shoppers were eating and drinking. We asked them to list one-by-one all food items they purchased to improve their household's or party's football-viewing. Several themes arose, including salty snacks, alcohol, soda, cheesy foods, and dips. Among specific food and beverage categories, potato/corn chips (38% of respondents), soda (35%), dip (cheese and non-cheese; 28%), and beer (20%) were most popular. Rounding out the top 10 were pizza (9%), burgers (8%), hot dogs/brats (7%), veggies (7%), crackers (7%), and popcorn (6%). 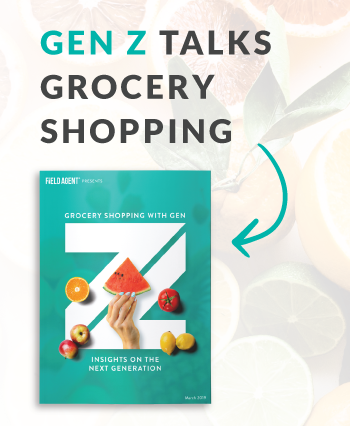 Broadly speaking, salty snacks—including potato chips, corn chips, tortilla chips, popcorn, pretzels, and cheese-flavored snacks (e.g., Cheetos)—outpaced all other categories. In all, there were 167 mentions by our sample of salty snacks in one form or another. Alcohol was also common on this first full day of the season, with 71 mentions of beer, wine, or some other alcoholic drink. 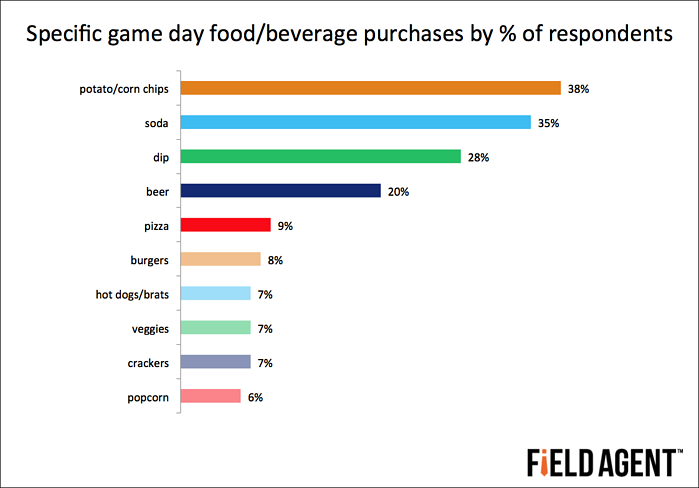 Consumers were also asked what food items, if any, they eat exclusively during football season. Only one item stood out: buffalo wings, mentioned by 13% of the sample. As the results above might suggest, many treat game day as an opportunity to fire up the grill. In fact, 40% of consumers surveyed said they would grill—everything from steak to lobster to ribs—before or during the game. Additionally, 29% said they would mix alcoholic beverages, 19% would pick up "take out," and 11% would have food delivered. We were also interested to know a little something about these customers’ in-store experiences. We asked them, for instance, if they had purchased merchandise from a football-themed store display. 16% said "yes." We also asked if they had purchased a product in football-themed packaging, to which 9% answered in the affirmative. We were also curious what football fans would say was missing from their football-viewing. That is, we asked them about their game day wish lists. What, if anything, is your game-watching lacking? There was a tie for first place, by two very different wishes. One with a price tag; one without. Wholly 23% of those who responded said people—most often family and friends—were missing from the party. The other first place response, also at 23%, was one or more food items. Customers also coveted bigger or better TVs (9%), alcohol (6%), and/or grilling (6%) to further improve their game day experience. Football is a social affair, even when watching from home. As seen, a majority of our sample invited guests to watch the game, and friends and family came readily to mind when customers were asked what their game day experience was missing. Yet social media connects people separated by physical distance, and 70% of football fans indicated they or a member of their household/party would participate in social media during the game. Of course, all this socializing generally occurred within viewing distance of a TV. 89% of respondents admitted they would watch more television on this particular game day when compared to a normal day. And, for our sample at least, most of the fun remained under a roof. 87% said they would spend less time outside on this first Saturday of college football. How do at-home football fans spend halftime? 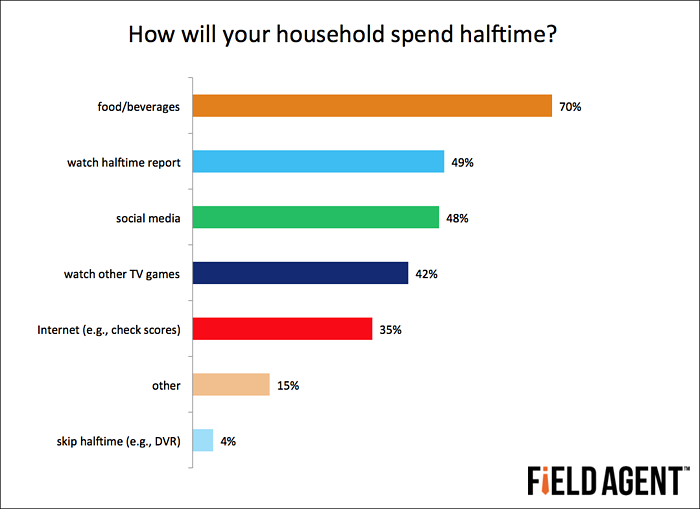 The top answer, at 70% of respondents, was “consuming snacks, food, and/or beverages.” 49% said they would watch the TV halftime report and 48% would engage in social media activity. These were not mutually exclusive options; respondents could choose more than one. And what about commercials? Do at-home fans watch them, ignore them, zap them…what? 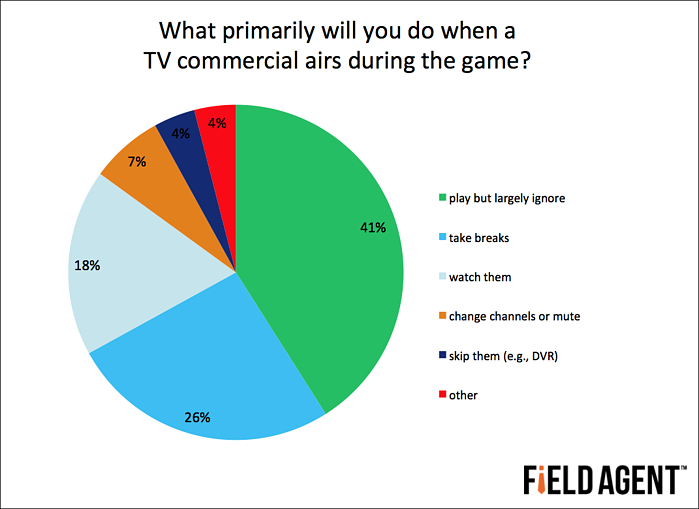 More than any other option, fans said they would let the commercials play but largely ignore them (41%). Some 26% said they would use commercials as an opportunity to take a break—to the restroom, to refresh their plates, or otherwise. One unique strength of mobile market research is the ease of capturing photos and even videos of in-store and at-home events, like the first full day of college football season. Below is a sample video of how fans watch football in their homes, complete with food, beverages, the game, and, in some cases, friends and family. Whether it’s Christmas morning, game day afternoon, or Halloween night, mobile market research makes it easy and affordable to collect real-time insights on your fall-time and holiday customers.